They say that nothing lasts for every. 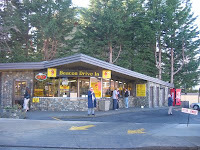 Well maybe so, but the Beacon Drive Inn next to Beacon Hill Park has now been open for 50 years and the new owner plans to keep things as is. For many years they have pumped out the best soft ice cream cones in the world. I have taken so many people there and everyone has confirmed what I believe is the best soft ice cream anywhere. On a hot summer day there is a line up stretching out into the street. It is amazing that their machines do not blow up! They serve pretty good food also, but I go there mainly for the ice cream and will continue to do so. Give it a try, you will not be disappointed.